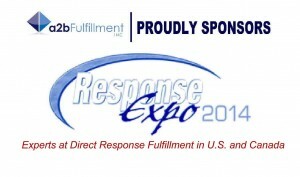 We’re excited about prepping for the annual Response Expo to be held in San Diego. Events kick off on Tuesday April 29th at 5:30 pm. The show concludes on Thursday May 1. This is a great opportunity to enjoy this direct response industry event which is jam-packed with educational presentations and scores of exhibitors and industry experts. Visitors to our Booth #500 will discover in one brief meeting why our path to direct response is unique from other fulfillment centers and ultimately leads to increased profits. They will learn how most consumers can be reached in 2 days or less via the least expensive shipping method – ground. We will present our simple and powerful ‘Ship Smart, Save Money’ story. Our strategic SE location makes our fulfillment center the single best spot for shipping in the US. We are close to the majority of the US population, unlike a Western or Midwestern location. Bottom line is that when you locate your shipping point close to your customers, you save money. That’s what makes it Ship Smart. For direct response marketers who are considering a campaign test or are a new start up operation, our EZ START Fulfillment Program will blow them away! A one-price, fixed menu of services that will cover all the back end support functions, allows campaign testing, starting up or switching easily and with budget certainty. Direct Response marketers who visit with us will find out how they can Save over 60% with EZ START. And they will avoid a lot of headaches and hassles by letting experts handle the back-end, while the marketer focuses on the front end. We will also show them the magic of our path to handling returns, which are part of every DR campaign. ‘a2b’s “Returns to Profit” program shows how to use returns to make happier, loyal customers AND save or make money. It almost sounds too good to be true, doesn’t it? More and more marketers are interested in marketing to the 33 million people in Canada. Our Toronto facility creates a seamless one-stop shop for this market. No need to deal with an entirely new set of vendors. We have it all. We also plan on emphasizing that ‘a2b offers services on an a la carte or turnkey basis. By discussing the unique needs of each client, together we can build a solid back-end support system. Hope to see you there!